The Roanoke County Sheriff’s Office is invested in serving our community through many different avenues. Our Community Outreach Deputies spend much of their time in local schools interacting with children and attending special events. Regular staff also takes part a myriad of charitable events, teaching special classes to the public, and participating in the Citizen Police Academy. We also have an inmate work force program for highway beautification and to assist Roanoke County Parks and Recreation. 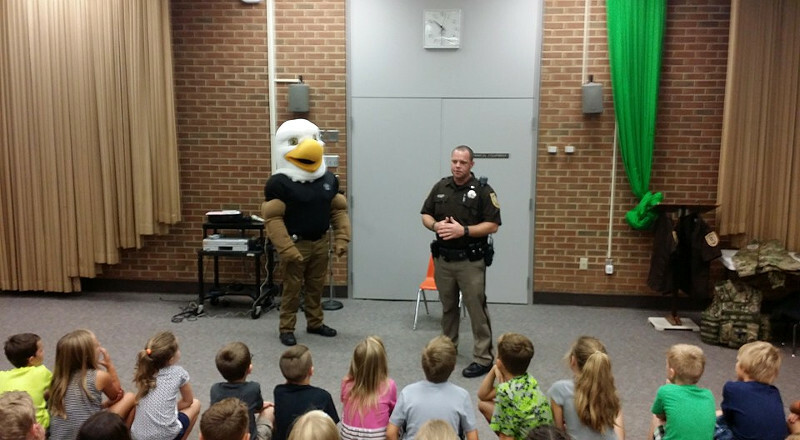 Its also not unusual to see Rocco the Eagle out and about in the community! The Sheriff’s Office is committed to building and maintaining close relationships with our community in order to better serve the citizens and provide the level of service that the public deserves. This course is designed to give people a better idea of what it means to be situationally aware and to help them to develop personal defense strategies. This course is designed to educate the public on the safe handling and storage of firearms, and the issues that come with being a responsible firearm owner, as well as collect food items for local charities. This course will meet the training requirements for the Virginia Concealed Handgun Permit. The Inmate Work Force was established in order to provide a labor force for Roanoke County as well as give the selected inmates the opportunity to dispose of sentence time by working as a member of this program. Learn more about our Inmate Work Force. The Roanoke County Sheriff’s Office has participated in the Special Olympics fundraising for many years. Our deputies volunteer their time to participate in the Law Enforcement Torch Run, Poker Run, Polar Plunge and many more events. Each year our Sheriff's Office conducts its annual Law Enforcement Torch Run for Special Olympics. Learn more about our activities to benefit Special Olympics. The Roanoke County Sheriff's Office is proud to partner with local first responder agencies to be a part of this outstanding program for young adults with unique challenges. For members of the community that need to get rid of expired or unwanted prescription medications, we provide a secure drop box so that they can be disposed of according to DEA guidelines. CHIP of Roanoke Valley is an early childhood home visiting program that pairs low-income children, ages birth to kindergarten-entry, with a Community Health Nurse and Family Case Manager for health care coordination, developmental education, kindergarten preparation and regular child assessment and monitoring. See our most recent Tug for Tots fundraising campaign to benefit CHIP.